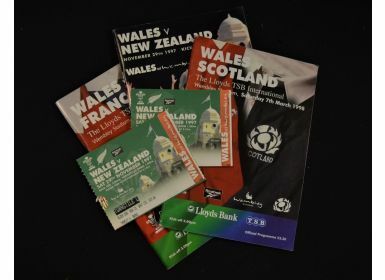 1997-1998 Wales at Wembley Rugby Programmes etc (5): Three programmes and two (similar) tickets from the period when Wales, building Cardiff's Millennium Stadium, played home games at the old Wembley. Issues for the 1997 clash with NZ, along with a pair of tickets, and for the 1998 'homes' against Scotland and France. Good or better.